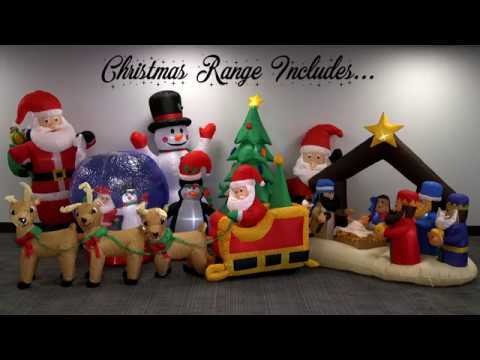 Bring Christmas cheer to your garden with an inflatable Santa with list. An internal powered fan inflates the figure up to 6ft in height and internal LEDs provide an illuminating glow. Ideal for indoor and outdoor use; just keep the 12Vdc mains adaptor sheltered from the elements. The weighted base keeps the figure upright and secure, and ground spikes are supplied for when extra fixing is required. Made from durable nylon material, simply fold away to a compact size for easy storage.